Ok, so John Lennon wasn’t talking about OfSTED inspections, the farce of grading schools or the tendency for educational complexity to be brushed under the carpet of simplicity, as if everyone is too stupid to understand. But the chorus kind of works doesn’t it? Just Gimme Some Truth!! Well it does if, like me, your idea of ‘truth’ is something that encompasses the real complexity of the notions of educational standards, quality, school effectiveness, leadership, attainment, progress and so on. As I’ve said before, fundamentally I reject the idea that schools can be judged in a meaningful way via inspections. By ‘judged’, I am not talking about an experienced visitor giving some insightful developmental feedback based on an analysis of the available data and their observations; no doubt, there are some people out there who can do this well enough. I am talking about the process of distilling this mass of qualitative and quantitative information into a simple set of final grades, with one overall Judgement Grade. The extent to which we accept this in our system despite the enormous flaws and the absence of proper validity trials continues to astonish me. The data delusions that underpin RAISEOnline hold sway where they have no right to and the complex truth of how good a school is continues to be reduced to the absurd simplicity of two or three data points. At the end, we get told that School X is Good. School Y is Outstanding. School Z Requires Improvement. It’s like we’ve been overrun by The Emperor’s New Scientologists and Homeopaths but everyone’s too scared to say anything. Why am I bothered right now? Three reasons. 1. Getting ready for the term ahead, I’ve been analysing my school’s RAISEOnline and, after I suspend disbelief and start working within the (slightly bonkers) framework of convoluted algorithms, it’s a complicated story. Some areas are Green; some are White and one or two are Blue. Our figures for Disadvantaged Pupils are strong – mostly Green. Despite being well below national average on raw overall outcomes, the cohort was 70% disadvantaged with a low entry profile and VA is very strong. You see, it’s a complex picture. I’m starting to think about the likely inspection this term and our SEF and I’m not sure what line to take. We’ll probably go for ‘Good’. It’s a ‘best fit’. But what’s that about? Why should we need to find a best fit? Why can’t we tell our complicated story? Who benefits from reducing it all to a one-word descriptor? I can’t think of a good reason to do it. 2. One thing I love about my school is that there’s a certain healthy fatigue about talking things up the whole time; that’s the old regime. Now we’d rather focus on real improvement and telling it how it is. 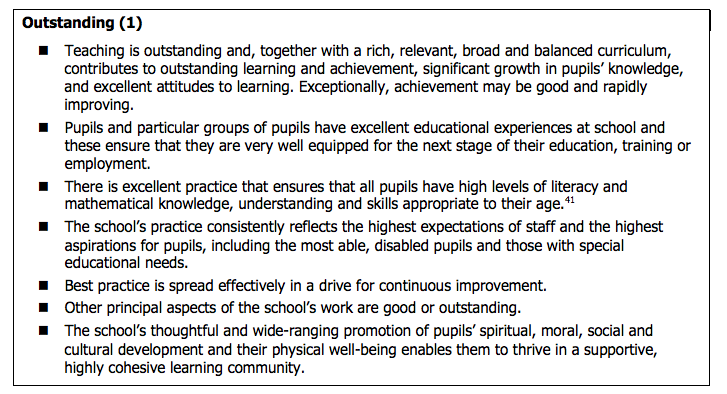 But, to be absolutely honest, the OfSTED Handbook is making me think bad thoughts. I’ve started tarting my school up in my mind as those ‘Outstanding’ descriptors tempt me with their promises of glory and public acclaim. I’m starting to have mock conversations in my head with Phantom Inspectors and finding that I’m less honest than I should be. I’m spinning a story, putting on some gloss, papering over the cracks, hiding my dirty linen……this is all WRONG!. I would love to have a frank exchange based on my detailed knowledge of my school so that the inspection would help me do my job – but when these people arrive for real, I won’t know them, I won’t trust them (how could I? ), the stakes will be high for the school and I will tell little LIES! I can see it coming. What kind of system is this? I’ll be torn between giving a nuanced story of strengths and areas for improvement and putting on a show to get the best overall grade we can – which will matter (too much) to parents and others looking in from the outside. 3. I met a good friend today who is also a Head. He’s been burned so badly in the last 12 months it makes me angry. His school went from Good to ‘Serious Weaknesses’ based on one year’s outcomes in one subject and an inspection that took place on the day of their biggest ever community event with hundreds of visitors. The inspection team included someone who wouldn’t shake hands with women (for religious reasons) and someone who didn’t understand the Sixth Form data. They didn’t listen to the Head at the time but the recent RAISE based on the most recent results (the results they were working towards at the time of the inspection) is Green all over – in every area. The school never had serious weaknesses; the inspection was Wrong. The judgement will remain in place until another inspection; they will claim that the inspection kicked the school into gear and delivered a good outcome but this will be a delusion. The results were on the way anyway – and the inspection got in the way, doing significant harm to the school’s reputation and to my friend’s health and self-esteem. He was crushed by it – and he’s a strong person. The nonsense is real – it has teeth. There are still teams of Sons of Tricky Dicky out there doing harm to people in the name of accountability; people who barely understand the term ‘confidence interval’ and actually think that ‘levels of progress’ is something you can measure with the accuracy of a ruler. It’s got to stop! If I rate my school against them, I could pick out bits from each box that apply. I could probably find some areas that actually Require Improvement. What’s the value in averaging it all out into a single grade? Why not simply list the statements that apply – assuming that the linguistic/semantic differences are enough to be sufficiently meaningful for the judgements to be made in the first place? Why on Earth did anyone suggest the idea that it was helpful or meaningful to draw a line between Good and Outstanding and give it VALUE.? And why do we continue to accept it? I know two London schools (from the inside) where recent inspections came down on opposite sides of this artificial line. The truth? The Outstanding school really isn’t; the Good school was probably short-changed. That’s my truth. Obviously, both are on a continuum; both schools are on a journey of improvement – the G/O grade is utterly inadequate as a tool to capture the issues in those schools. The O school is more complacent than it should be; the G school has wasted energy picking people up after a bruising downgrading. 1. Get rid of the whole idea of grades and report inspection outcomes in the form of areas of strength and priorities for improvement. An Inadequate grade could remain if this was based on a much longer and deeper inspection process; beyond that – it’s just untenable (and I say this knowing there is widespread, passive acceptance of grading). 2. Report the data outcomes in a detailed data report that includes much of the RAISE Online profiling – with as much complexity as necessary and no less. Schools could update their online Data Profile annually immediately after each set of results – instead of waiting until December. I’d argue that it is literally impossible to ‘consider’ this meaningfully during an inspection. There simply isn’t time to identify whether there is a causal link between outcomes and classroom practice in this area. It’s false to suggest otherwise – and yet there it is alongside many other similar ‘Inspectors should’ statements that cannot be actioned without making a giant guess. 5. Begin every inspection with a meeting to establish the terms of reference and the code of conduct for all parties. During this meeting, a Head could establish the intellectual credibility of the team members, their knowledge of assessment systems and issues of data validity, their understanding of the terms Good and Outstanding as applied to teaching and their understanding of the limits of all the evidence at their disposal – before anyone goes any further. Of course this exchange might cut both ways but I think we’re entitled to know who we’re dealing with when the stakes are so high. Is there hope? We’ll see. Meanwhile, I’ll need to play the system the way it is. Those inspectors had better know their stuff – because we will be on it like they won’t believe! It’s our agenda, not theirs and I’m not having my teachers dance to any tune but our own. UPDATE: Following publication of this post, it was widely read on the first day and brought to the attention of Sean Harford, OfSTED’s new National Director for Schools. To his great credit, he has responded in depth, maintaining a very measured tone. I’ll be interested to follow up on some of validity questions I have raised – but I am delighted to hear that a grade-free SEF would be considered an option. That is something we may well explore. I will ask my friend (from Reason 3) if he’d welcome a follow-up – that may be worth doing for his school. Thanks to Sean for such a prompt and detailed response. Once again, I need to remind myself that blogs can reach beyond the twittersphere and have direct impact. Mind you, I might not have written quite so freely and honestly if I’d thought about that at the time! « Looking Back on 2014. Great article which can give us hope. I write as a classroom teacher. Over the years it has irritated me how every teacher has to listen with respect to feedback from an inspector eg “I would have liked to have seen more, less of …whatever”. And we say, oh thank you so much (for not giving me a 4). No teacher can ever say, I disagree…on what basis do you think this… You’d be strung up by management ( understandably). So the surface respect continues. As a minimum an inspector should be required to present his CV to a teacher about to be observed. That idea just came to me!